Have you met my Magic Bullet yet? Internet… meet the Magic Bullet. Magic Bullet… meet the Internet. There, formal introductions are complete. Now, on to the dirt. 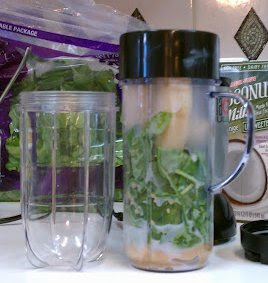 I <3 my Magic Bullet. So much, in fact, that I’m on my third model. The internal base of my first cracked while I was blending (which turns out to be a known problem), but I’d gotten a solid three years of use out of it, so I didn’t complain too much. I went to Costco and picked up Bullet #2. That was two or three years ago. Bullet #3 was non-essential – a purely indulgent purchase. 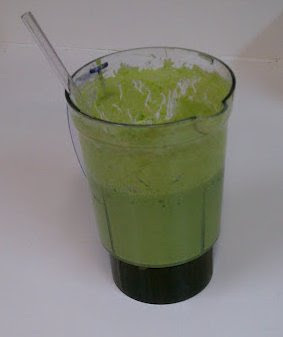 I’d been using Bullet #2 to make green monster smoothies and capacity was an issue. I couldn’t get a full banana in even the largest container. I like a LARGE green monster in the mornings. Supersized, even. I’d heard rumors of a blender carafe for the bullet. I could buy one on Amazon for around $15 + $5 shipping, or I could go to Costco and spend $50 to buy a whole new set, blender included. Given that Bullet #2 was on its third or fourth year, I assumed that the remaining life is limited and opted for the Costco route. Bullet #3 is now in operation, and Bullet #2 is on reserve in storage for crazy smoothie blending parties to come. Ok, so why do I love it so much? First of all, I’m aware that it has limitations. It’s not fantastic for everything. For larger jobs, my Cuisinart food processor blows it out of the water – in blending, consistency and capacity. 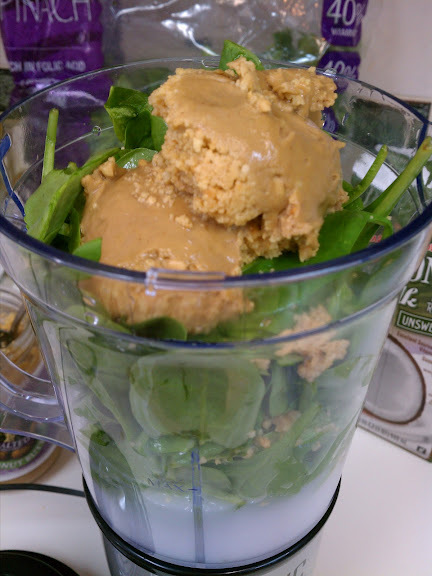 My food processor is pretty awesome… but that’s a different post. Let’s get back to the bullet. So what’s it great for? – Small jobs, like chopping nuts, making small amounts of fresh whipped cream, blending small batches of pancake batter, making smoothies. The brilliance of it is the fact that it’s small and the blade is attached. The reason this is important is because (just like every other blender I’ve encountered) stuff gets stuck to the sides. 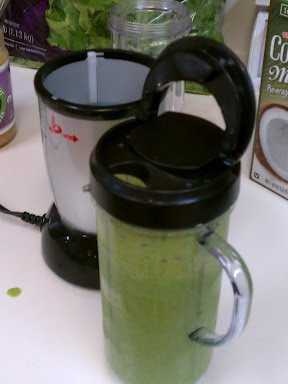 I know, a Vitamix would probably blow the bullet away, too, but it darn well should for ten times the cost. And that’s beside the point. With the bullet, when stuff gets stuck, you pick it up and SHAKE it. Bang it on the counter, turn it sideways, turn it upside down, shake vigorously, whatever it takes to get things moving again. Then, when you put it back on the base, you can angle the whole thing to 45 degrees and it blends everything much better. Or, you lock the blender in to the base, pick up the whole thing and shake while it’s blending. Ya can’t do that with no regular blender. – Easy clean up. The Magic Bullet’s original design was such that you drink from the container you blend in, so the only thing to clean is the blade (until you finish your drink, that is. EASY. 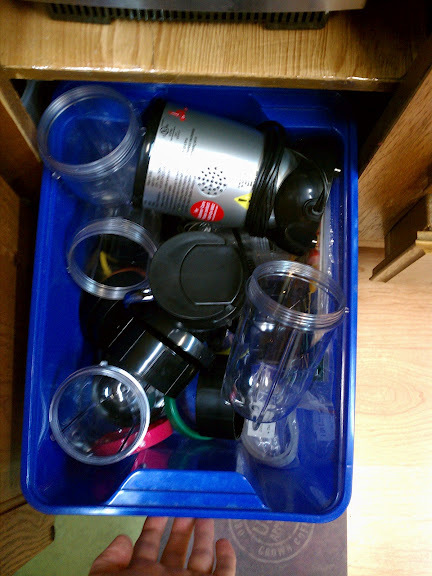 With the blender carafe, if you transfer in to another container for drinking, you have a bit more cleaning to do. Really, you could just throw a straw in the sucker and drink away. Looks a bit silly, but it works. – Bullet Blender. The blender carafe has lent some of the brilliance of the small, enclosed design over to increased capacity, and it makes things like shaking the entire unit a bit more difficult. However, I’ve done it. I’ve also done the 45 degree tilt while blending. It’s still small enough to manage. The flaw I see with the bullet blender is that when you lock the lid in place, the lid is ready for pouring, which doesn’t work great if you want to shake or tilt the machine. Oh yeah, there’s also a ridiculously low “max” fill line on the blender carafe. About half way up. Pshhaw. That’s for wussies. I just ignore it. Fill it up. – It’s small. I love that all of my pieces fit in a small box under the cabinet. I pull out the few items I need, then put the rest away. It takes up minimal counter space while out. – Larger cups. These new cups are just slightly larger than the “large” old ones, but that little bit helps. It’s the difference between fitting half a banana and a full one. – Flip lids?!? These things are AWESOME! I love that they added these to the new package. Nicely done, Magic Bullet. Nicely done. no spill flip lid! woohoo! In summary… the Magic Bullet is pretty darn awesome. I <3 it. It’s definitely in my favorite things list.